in the U.S. — the doors have always been open to diners since 1826. Boston established as the captial of the Massachusetts Bay Company's colony by Puritan John Winthrop. 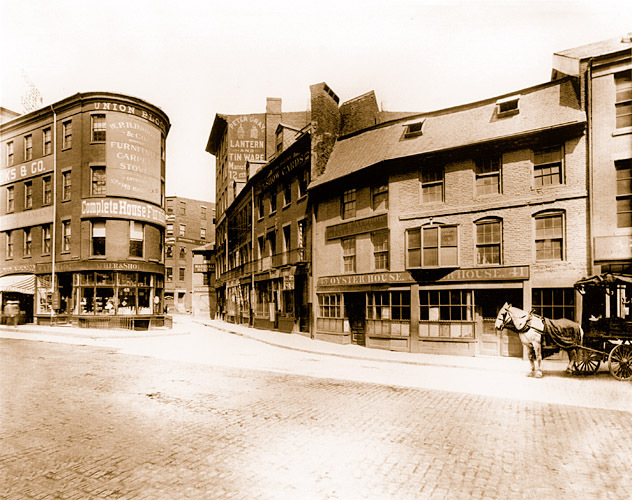 Union Street was laid out in 1636, two years after the Boston Common was established, but there are no municipal records documenting the Oyster House's date of construction. All that is known is that the building has stood on Union Street as a major local landmark for more than 250 years. In 1742before it became a seafood house, the building housed importer Hopestill Capen's fancy dress goods business, known colorfully as "At the Sign of the Cornfields." 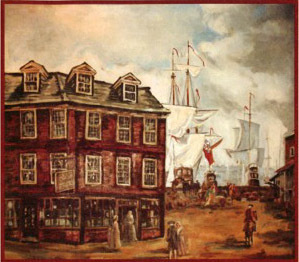 At this time, the Boston waterfront came up to the back door of the dry goods establishment, making it convenient for ships to deliver their cloth and goods from Europe. 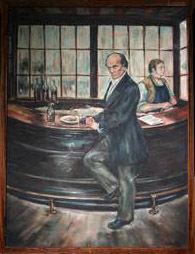 Oysters were first served to the public in this country in 1763 when a primitive saloon was opened in New York City in a Broad Street cellar. 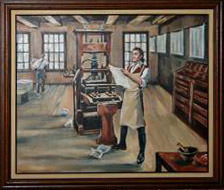 The first stirrings of the American Revolution reached the upper floor of the building in 1771, when printer Isaiah Thomas published his newspaper "The Massachusetts Spy," long known as the oldest newspaper in the United States. 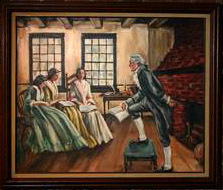 In 1775, Capen's silk and dry goods store became headquarters for Ebenezer Hancock, the first paymaster of the Continental Army. There is no reason to doubt that Washington himself was familiar with its surroundings. 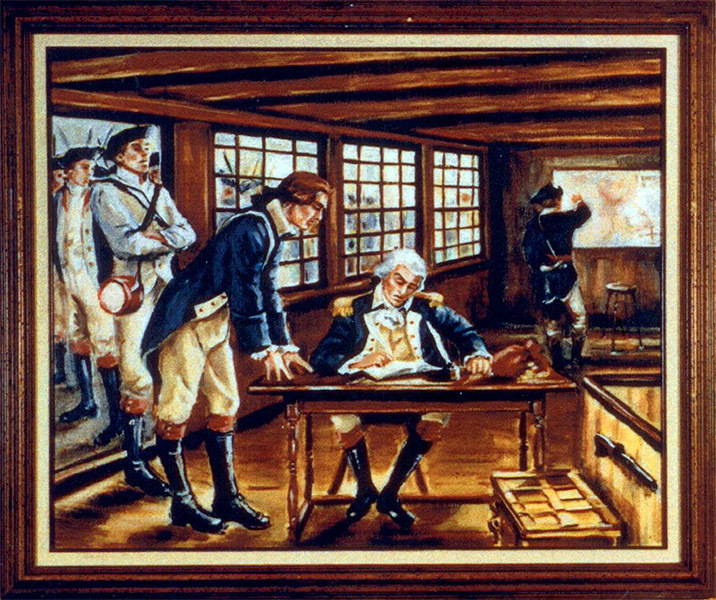 At the very spot where diners today enjoy their favorite New England specialties, Federal troops received their "war wages" in the official pay-station. 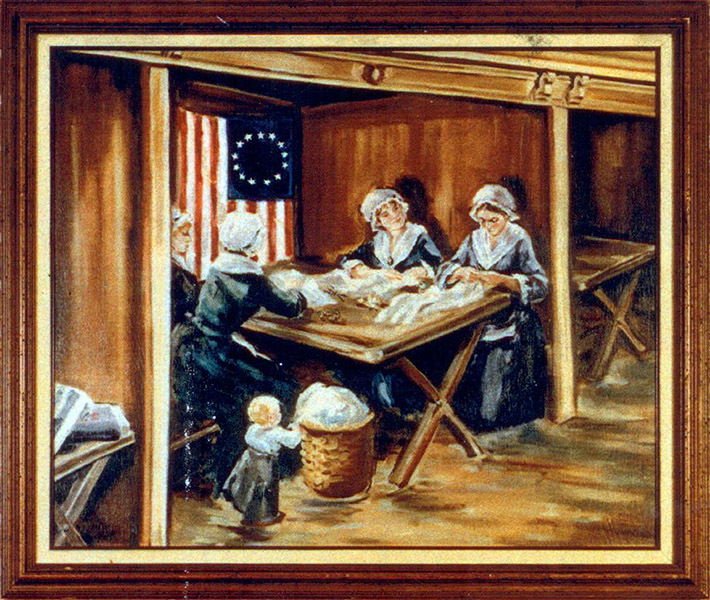 During the revolution the Adams, Hancock, and Quincy wives, as well as their neighbors, often sat in their stalls of the Capen House sewing and mending clothes for the colonists. 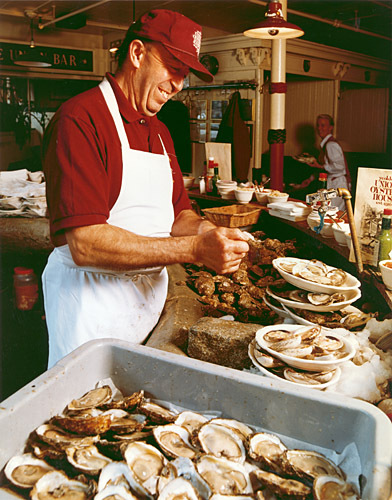 In the 19th century, the American people were enveloped in an oyster craze. 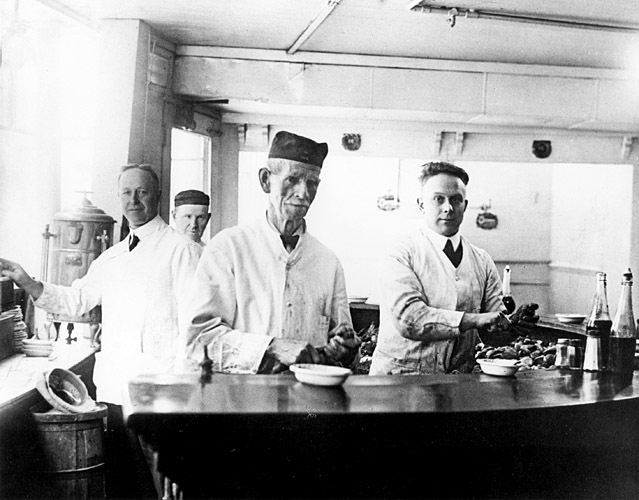 In every town there were oyster parlors, oyster cellars, oyster saloons, oyster bars, oyster houses, oyster stalls and oyster lunchrooms. 1826 marked the end of Capen's Dry Goods Store and the beginning of Atwood and Bacon's establishment. 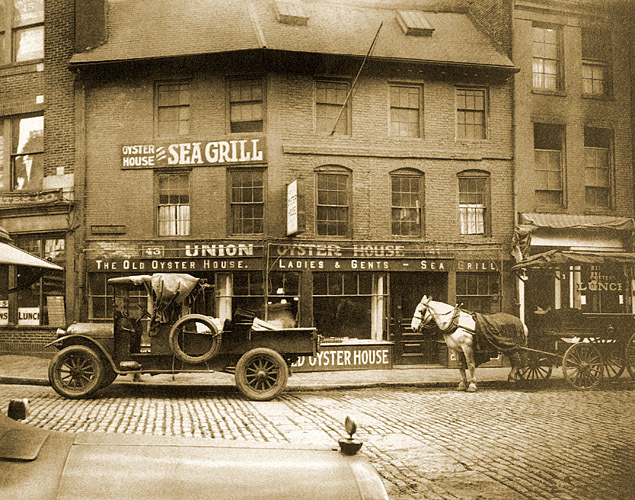 The Kennedy Clan has patronized the Union Oyster House for years. J.F.K. loved to feast in privacy in the upstairs dining room. 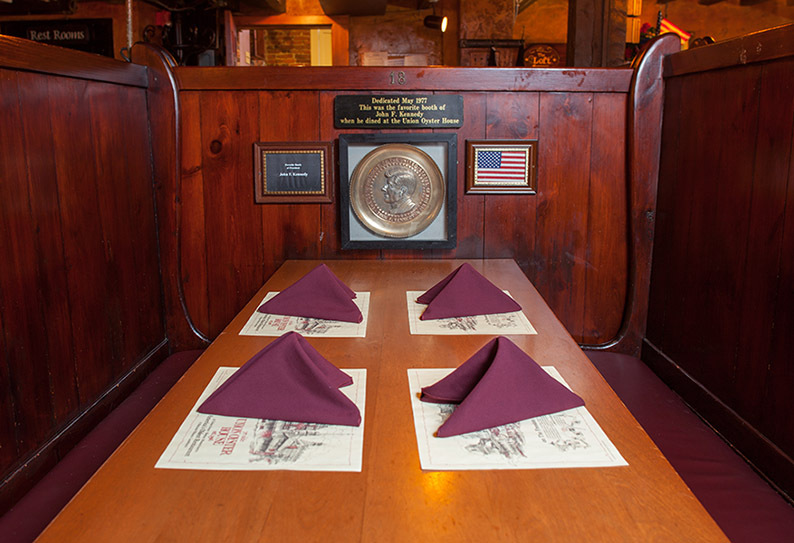 His favorite booth "The Kennedy Booth" has since been dedicated in his memory.